In Irish mythology there is supposed to be a leprechaun's pot of gold at the end of a rainbow, but what about two rainbows? This had to be one of the most vibrant rainbows I have ever witnessed in my life. A second rainbow was forming just above the first. Notice the colors of the second rainbow are in reverse of the lower one. I just noticed I had published less to my blog this month than usual and have been wanting to publish more. Just a very busy time of year I apologize, and I have been working on a new website. It's not quite ready yet. 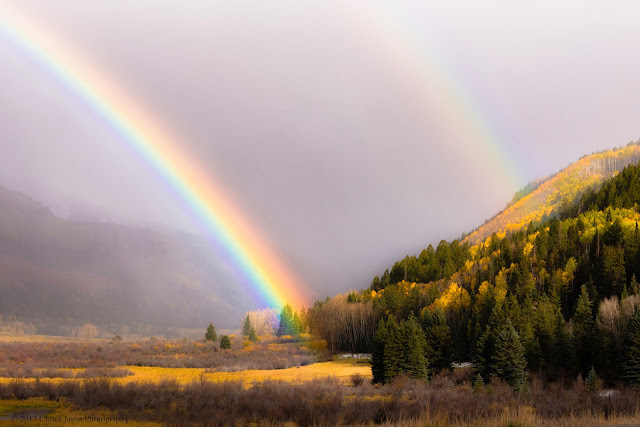 Another meaning of the pot of gold at the end of a rainbow is to have one's hopes and dreams; ultimate success, fulfillment, or happiness all of which I hope for you. With this year of 2013 coming to a rapid close, I'm hoping 2014 Year of the Horse will be a great year for all of us. Thanks for looking!